Bellator 210 takes place at the WinStar World Casino and Resort in Thackerville, Oklahoma on Friday night, live on DAZN. The main event features a middleweight showdown between Chidi Njokuani and John Salter. Njokuani (18-5-1 no contest) comes in on a tear, having won eight of his past nine fights. Seven of those victories were at welterweight. His sole loss was to former welterweight champion Andrey Koreshkov. The 29-year-old made a successful debut at 185 pounds in his last outing, defeating Hisaki Kato by unanimous decision at Bellator 189. MORE: Join DAZN free for 30 days and live-stream fight night anywhere! Salter (15-4) enters the match having won seven of his past eight bouts, but his last fight was a third-round submission loss to middleweight title challenger Rafael Lovato Jr. at Bellator 205 this past September. 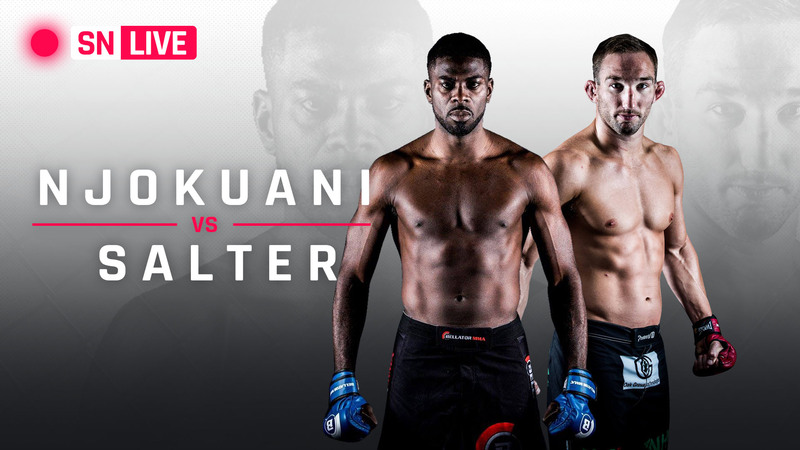 Can Njokuani surge closer to title contention, or will Salter be able to get back in the win column? Sporting News will be providing live coverage of the main card beginning at 9 p.m.
9:43 p.m.: Coming up at Bellator 210, Kristina Williams squares with Bruna Ellen in women’s flyweight action. After winning the first two fights of her career, Williams (2-1) suffered her first career setback to upcoming title challenger Valerie Letourneau at Bellator 201 in August. Ellen (4-1) has won back-to-back contests, but is returning for her first fight in 15 months. If Williams can apply pressure early on, she should be able to wear Ellen down. Ellen needs to try to finish it early or try to dictate the pace, so she doesn’t wear herself out. Cage rust is definitely real. 9:31 p.m.: Archuleta def. Spoon by unanimous decision (30-25, 30-26, 30-26). Couldn’t ask for a better performance than what you saw from Archuleta. He battered Spoon for 15 minutes from one side of the cage to the other. Archuleta ripped the body, then went upstairs and even took the fight to the mat. Give Spoon credit for absorbing those hard shots because he winced more than once, but ended up on the short side of the stick. Archuleta has now won 16 in a row. It’s hard to deny him a title shot against 145-pound champion Patricio Freire. There’s nothing else to do besides fight the champion at this point. No other guy makes sense for Archuleta. 9:05 p.m.: The main card of Bellator 210 begins with Juan Archuleta taking on Jeremy Spoon in featherweight action. Archuleta (20-1) is on one of the best runs in the sport, as he’s won 15 consecutive fights with eight wins coming by stoppage. Spoon (20-4) comes in having won four of his last five. This should be an entertaining fight with two prospects looking to inch closer towards title contention. 9:00 p.m.: Welcome to Sporting News’ live coverage of Bellator 210. Settle in and grab some refreshments as we should have a great night of action. – Sporting News explains why you should watch out for Juan Archuleta , as he takes Jeremy Spoon on the main card.